Chapter members and friends celebrate the Flag of the United States of America on Flag Day and Memorial Day. 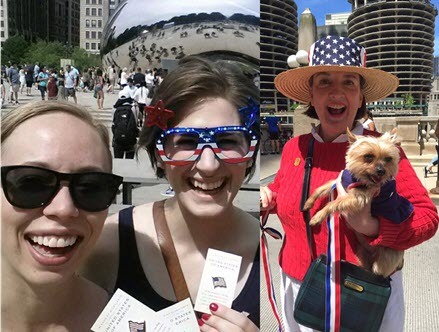 Voices ring out as Chicago Chapter members give away American Flag pins to passers-by along Chicago’s Michigan Avenue in celebration of Flag Day in June. Since 2008, the DAR Chicago has enthusiastically given flags to children, couples, and veterans—people from all walks of life—including some visitors to the United States! Members of the Chicago Chapter also march in the Memorial Day parade along State Street with other Chicago area DAR, C.A.R., and SAR chapters. Contact the web site adminstrator | This site last updated January 2, 2019 | The DAR Insignia is the property of, and is copyrighted by, the National Society of the Daughters of the American Revolution. | Web hyperlinks to non-DAR sites are not the responsibility of the NSDAR, the state organizations, or individual DAR chapters.